The "Blizzard of 2012" has hit us square in the face and once again Seattle is trapped at home for the most part. Yours truly included. The writing was on the wall of course, the Facebook wall, with many of us pointing to Cliff Mass's blog. This is the man who practically invented weather and yet was unceremoniously thrown off of the Seattle NPR affiliate KUOW, (aside). While Seattle was coping with the blizzard Portland was dealing with rain of biblical proportions. The LA Times made fun of Seattle and Portland probably made fun of itself, but it definitely made fun of something, but in a very cynical, ironic and almost imperceptible way. In the end, we're all left to wonder if maybe the Mayans didn't just get the month wrong. 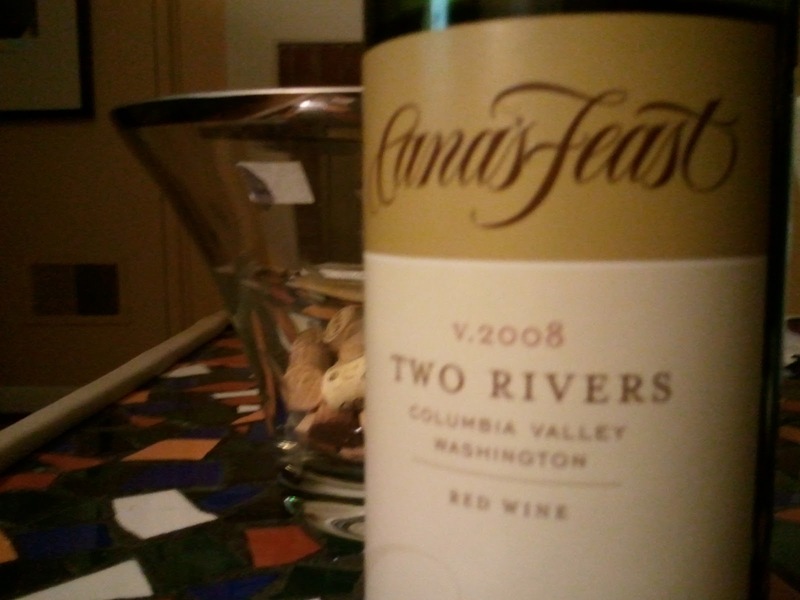 The Cana's Feast 2008 Two Rivers blend is of the Bordeaux style sort, the wine is plush, velvety and comfortable, perfect for your blizzard or flood inspired lock down. Cana's Feast is one of a handful of Oregon wineries that is making a goodly amount of Washington sourced wine. The winery's name has biblical inspiration so it'll pair well with your wintry End of Days scenario. With the Two Rivers they've delivered a value priced $18 wine that's coming from Washington vineyards like Coyote Canyon, and Red Mountain's Tapteil and the big dawg, Ciel du Cheval. Gobs of dark fruit, cedar and spice as well as nice structure and acidity make for a wine you can pair well with dinner or drink by the fireplace. This hearty red fits you like a warm flannel shirt on a cold winter day and even if it's only raining a lot, if the flannel is tight enough and paired with a handlebar mustache, that'll work too. The Cana's Feast wines are pretty readily available in the flood and snowed in markets, at a variety of grocers including Fred Meyer, Safeway and Zupan's. In Seattle look for the wines at Whole Foods or Sixth Ave Sellers. Hopefully these are locations that you can either walk to, or take a boat.